For this week's Valentine's Day/Love Makes The World Go Round Challenge for The Kraft Journal, I made a sweet little card using a Buff Ivory Note Card as my base. To that, I added a couple of different patterned papers from Recollections, and then attached a Small Glassine Bag that I embellished with a journaling card and a piece of Red With White Polka Dot Washi Tape. I also tucked a Grungy Prim Shipping Tag into the Small Glassine Bag, and I topped the Grungy Prim Shipping Tag with a length of the sweet Vintage Winter White Hand-Stained Bias Tape. You may also notice that I added a small Melissa Frances heart rub-on, and I ALWAYS use my Bone Folder Tool to apply my rub-ons with great ease. I couldn't do without it! My only other supply is the Recollections paper clip I attached. We're really hoping that you will stop by The Kraft Journal this week to play along in our Valentines Day/Love Makes The Word Go Round Challenge . We always love seeing your creations, and the Kraft Outlet can help you find ALL the best supplies for your projects. Simon Says Stamp Monday Challenge - Simon Says - "H is For.......Hearts"
Classy Cards 'N Such - Challenge #70 - Shabby Chic Hearts - I used lots of hearts. I also used white seam binding and mini pearls from the CCNS store. Gorgeous. Love the heart embellishment on the bag and all the pretty elements. 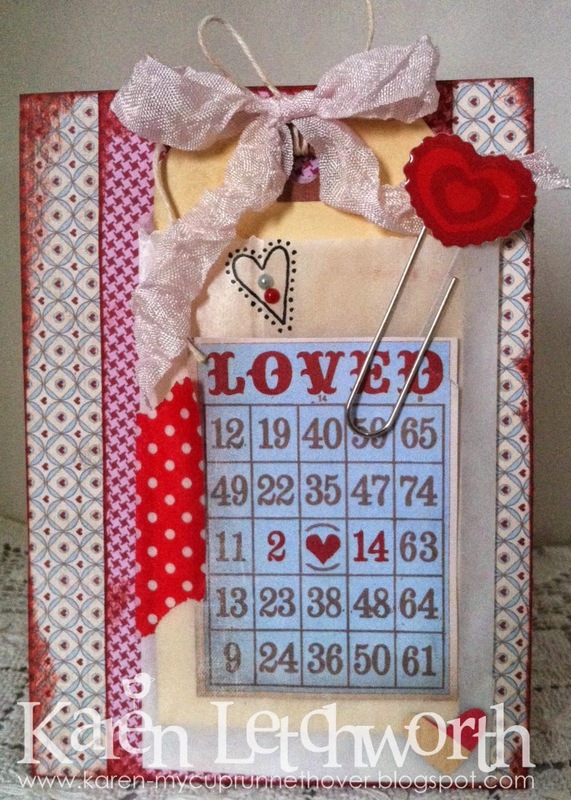 This is just darling with the sweet LOVE Bingo card and primitive tag inside the envelope. Right up my alley! Cute card Karen. Plenty of color and interest packed into this little card. Nicely done. Beautiful details and design! What a romantic Valentine's Day card, Karen! Thanks so much for playing Simon Says Stamp Wednesday “Anything Goes” Challenge! What a sweet card Karen - love that rich red on the heart! This is so stinkin' cute, Karen! I love the shabby bow and the cute clips you added. Love your style! Beautiful "Love" hearts card, Karen. Glad to have you join us at the Classy Cards n' Such weekly challenge. Gorgeous card Karen with all those beautiful "Karen" details you are famous for...love it, love it!! Another "piece of art'! Thank you for joining us at "Classy Cards 'n Such" for our "Shabby Chic Heart" challenge! Gorgeous card Karen with all the beautiful "Karen" details you are so famous for...another "piece of art"!! 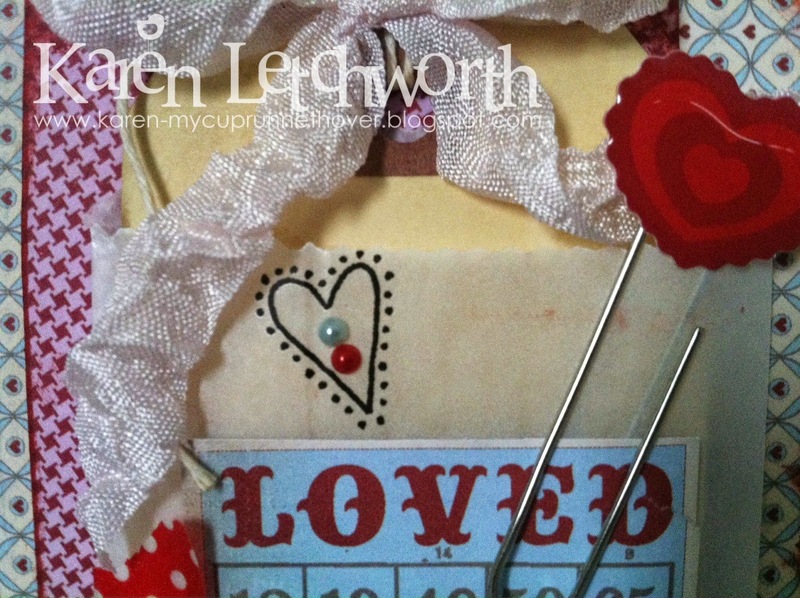 Thank you for joining us at "Classy Cards 'n Such" for our "Shabby Chic Heart" challenge! Karen, your card is so lovely. You have added so many wonderful details. Thank you for joining us for the Classy Cards N Such challenge. Great combination of colors. Thanks for joining us in the Classy Cards 'n Such Challenge. Beautiful card. You always have such amazing details. Thanks for joining us this week at the "Shabby Chic Heart" challenge at Classy Cards 'n Such!